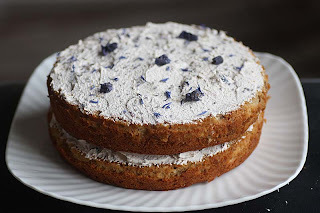 I've been day dreaming and talking to some blogger friends about making this 'Parsnip and Violet Cake' for a long while. I didn't think it was going to happen any time soon as I was waiting for an excuse to make it, such as a family get together, a party... but nothing like that is happening around me at the moment, so with plenty of time on my hands I thought I'd just go ahead and make it for me and my husband, and maybe an unexpected guest or two. I'd like to call this cake a Celebratory Cake, but I've nothing to celebrate or shout loud about at the moment. Yet whilst I was making it, I was feeling rather pleased with myself - I don't know whether it was my big head feeling smug about my homely creation, or the gorgeous perfumery scent wafting from all the purple ingredients, but I was feeling rather cheery. So I am going to call this a 'A Cheer You Up Cake'. This is not a sugary, sweet cake. 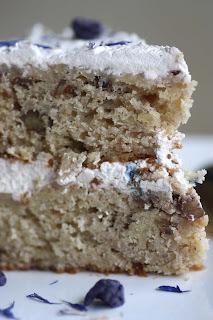 The parsnips add moisture rather than flavour to the cake. The flavour comes from the violet - all very subtle and the pecans give it that gentle crunch. A slice of Parsnip and Violet cake can only make you smile; and because I am feeling rather generous, I'd be happy to share some of this with you all, so if you wish your welcome to come on over, albeit virtually. A few words on the ingredients for this Parsnip and Violet cake. As a child I loved sucking on Parma Violets, the scent and the sherbety taste. 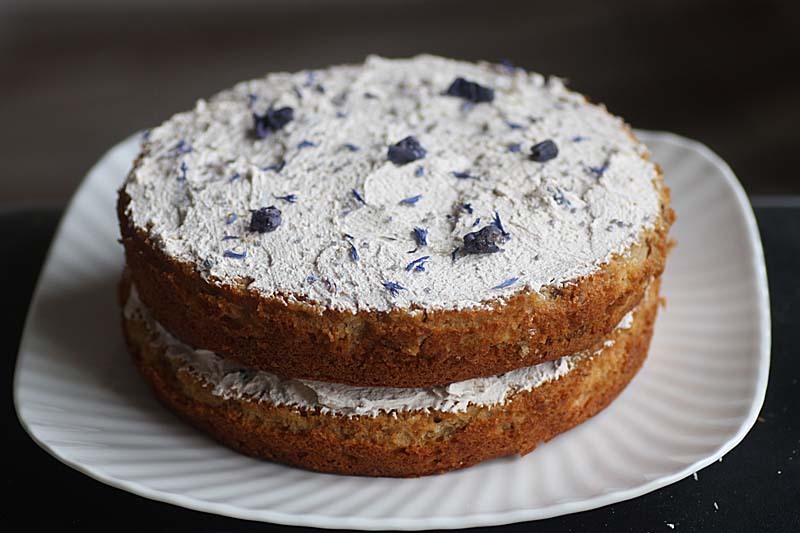 Over the past couple of years, I've been gathering all manner of edible violety to make sweet things such as Violet milkshake, Violet Sorbet, Violet Macaroon and Violet cake! 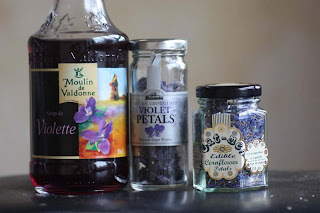 I got the Violet syrup from my trip to Brittany last year, the crystallised violet petals came from a supermarket, though I wish I was lucky to have some fresh violets to make my own. 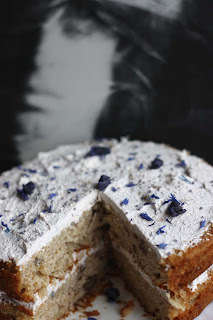 Here is a link to my dear blogger friend Kaths blog The Ordinary Cook making some crystallised violet petals recently, and finally the edible cornflower petals came from a cook shop in Scotland. When I was in Morecambe I also picked up some Sherbety Violet sweets from The Old Fashioned Sweet Shop, they are wonderfully perfumed, have a little crunch and then melt in your mouth - sublime. Preheat oven to Gas mark 4. Grease and line with baking parchment paper 2 x 8 inch sandwich tins. Melt the butter and sugar in a pan over gentle heat, then cool slightly and stir in the violet syrup. Gently whisk the eggs into the mixture, then stir in the flour, baking powder and cinnamon. Follow this with the grated parsnips, pecans and violets if using. Divide the mixture between the tins, then bake for 30 - 35 minutes. 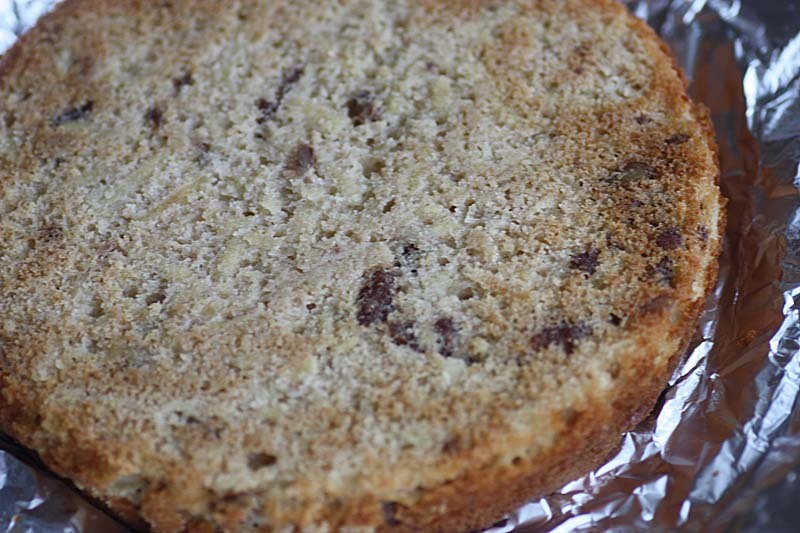 Allow the cakes to cool before turning out onto a wire rack. Whip togehter the double cream and the violet syrup. Spread most of it over one cake and sandwich with the other. Then spread the top with the remaining violet flavoured double cream. Scatter over some crystallised violets, fresh or dried violets, or edible cornflower petals in my case. 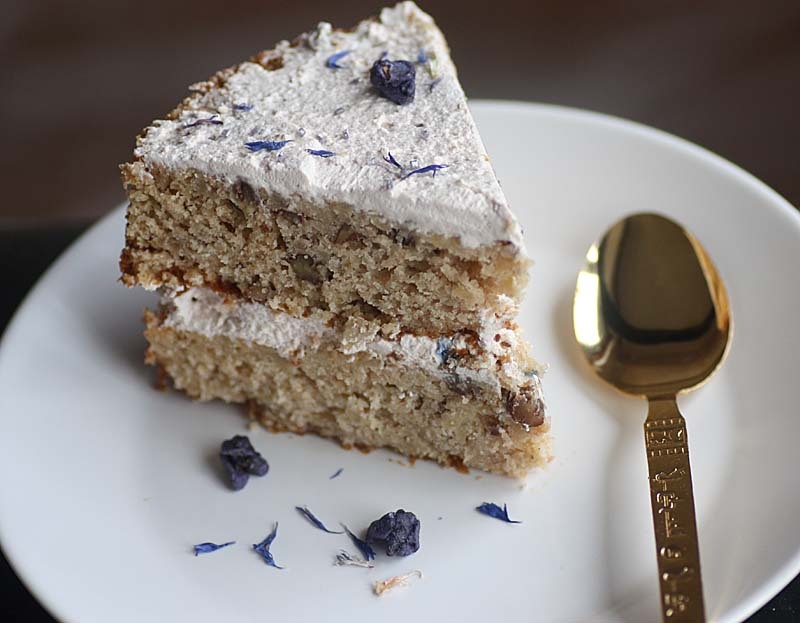 Enjoy a generous slice with a cup of good tea. and marvel at the colours, flavour and textures. This is an interesting cake! I've never baked with violets, but now I'm intrigued. Plus, I like your minimalist frosting! Wow, you really do make some interesting imaginative things! A violet cake sounds perfect, I cant imagine what violets would taste like, but they sure are pretty flowers. How lovely! I made Violet Jelly this Spring from violets I gathered from around my house! umm wowo, I love the look and cant even imagine the taste. Lovely. I hope that making it cheered you up a bit. I always find cooking therapeutic. I love cakes.... and l love Parsnips so this might help me put to good use the last of my Parsnips! I've just got to think of 8 to 12 like minded people....Any ideas for a glut of Purple Sprouting Broccoli? What a unique idea, I've never heard of a parsnip cake! This sounds lovely, and I love the candied violet petals. What a beautiful looking cake! I love the addition of pecans too! What a beautiful looking cake. I never would have thought of using parsnip in a cake. 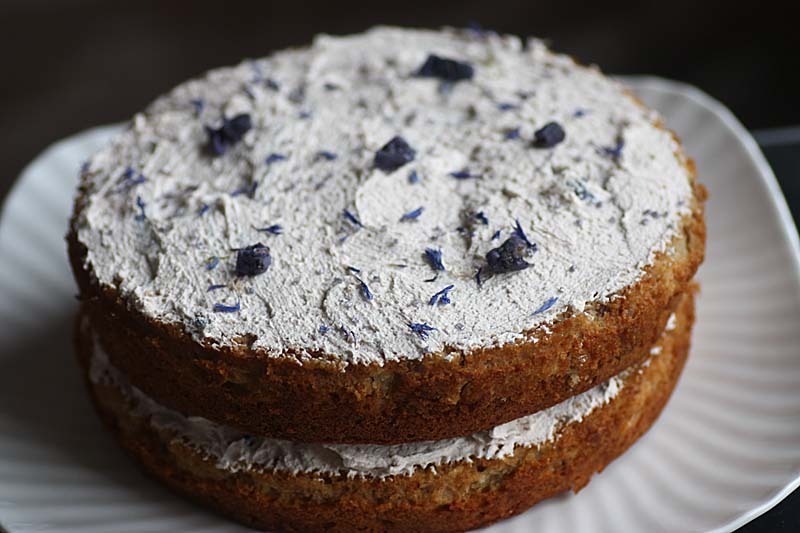 I will have to try this cake once I have sourced some suitable violet-ty produce. I like my minimalist frosting too as I am not that good with cake decoaration or piping creams. Its lovely to hear from you Rose. You must try it, you may just like it. I'll have to make Violet Jelly one of these days, shame I don't have violets growing around my house - lucky you! please trust me, its lovely and delicate. And you would be made most welcome. I do find cooking therapeutic and am presently enjoying it, but I'm actually looking for other distractions too as I'm afriad too much cooking may begin to feel like a chore. Hopefully something will appear on the cards. I don't know about Great minds, but we certainly are creative. I am so envious of the violets growing aroudn you as I would have loved some for this cake. I do hope you find some like minded people to share the cake with. Re Purple Sprouting Broccoli - you lucky you - As the season is so short for them, I just enjoyed them blanched and tossed in a potato salad, a bit like asparagus. Thank you so much Jodye. 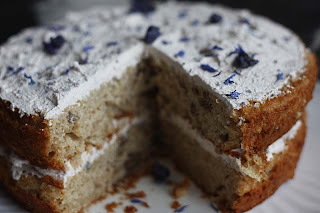 Hope you find some violet products to try and hopefully you'll get a chance to try this cake too. Thank you so much Salome. I really appreciate you repaying the compliment too. Your dream last night made me smile, I never knew that a recipe of mine woudl have such an impact - Thanks for sharing. You have visited my blog a couple of times and left some nice comments before, but thats okay as its always good to hear from you. Well, it LOOKS celebratory - I'd come over and have some with a cup of tea, we'd find something to celbrate over with this. Baking I find, is often its own reward! Loads going round on the violet front at the moment. Making me crave it! 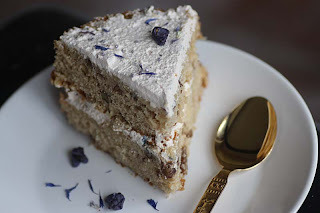 Mangocheeks - this cake looks absolutely beautiful. I will have to keep my eye out for some violet bits and pieces. This would certainly cause some "wows" if served for afternoon tea. This is gorgeous. And with vegetables in it? This is shooting to the top of my Must Bake list. What a great, innovative cake. I am going to make sure I try it and soon. Parsnips and voilets - what ingredients for a cake! I have not seen dried violets here, but I am sure I can find some online. Your cake is very beautiful - certainly a marvelous celebratory cake! Its lovely to make your acqaintance. You may be lucky to find some growing where you are and be able to crystallize some for decoration. As always its lovely to hear form you. 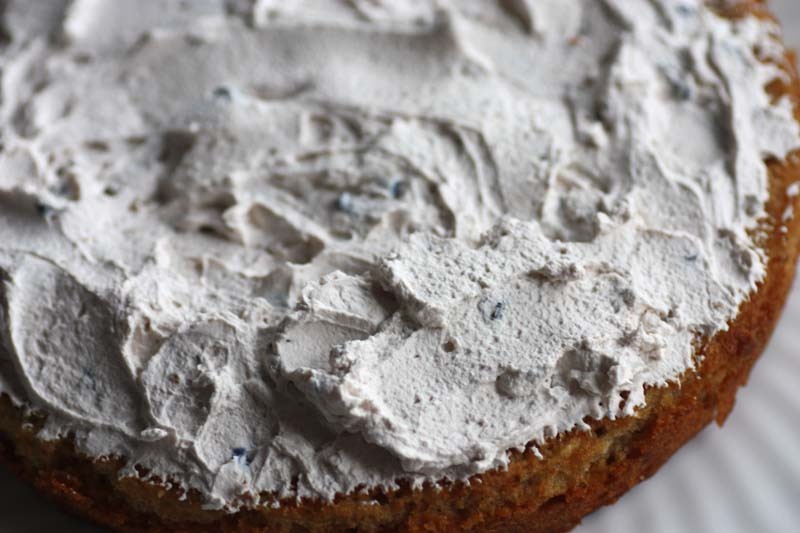 So pleased to read this recipe is shooting to the top of my Must Bake list, please let me know how it goes. If you can't find dried violets, if you have some growing aroudn you perhaps you can crystallize them yourself. This is a beautifully inventive "cheer you up cake," Mango. I can't help but smile just looking at it. Are the grated parsnips similar to carrots when used in carrot cake? And I was just thinking about violets and gathering them when ready to "sugar" them. I'm so envious of your fresh violets, I haven't seen any around here, though fellow bloggers are picking them down in England. The grated parsnips do act similar to a carrot in a carrot cake, but the flavour is different. Do you have parsnips where you are, they are a rather sweet root vegetable. I think it worked wonderfully in this cake. Wow, what an interesting cake idea! Never would have thought to use parsnip! I bet it's delicious though! Thank you so much Sophia. It really does work and it was really delicious. this is the best most yummiest cake ever, trust!!! I was rather pleased with this creation.